Meet Orly Taitz, Queen Bee of People Obsessed With Barack Obama’s Birth Certificate, June 17, 2009, Orange County Weekly, With her strong will, busy travel schedule and breathless blogging, Laguna Niguel dentist Orly Taitz has become the most controversial figure in the effort to prove that President Barack Obama is foreign-born. Orly Taitz questions Obama’s citizenship in Jeff City; receives support from 5 state lawmakers, July 1, 2009, The Kansas City Star, Taitz spoke to a crowd of about 40 at a hotel here this afternoon, and in a little over an hour threw a kitchen sink’s worth of accusations at the president. 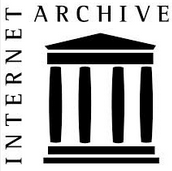 Does the Obama Birther Soldier have a case?, July 14, 2009, The Washington Independent, Cook is already drawing attention on conspiracist blogs. Orly Taitz: Worst Person in the World, July, 2009, MSNBC (video toward the end), Lawyer Taitz is an Obama birther who has filed other delusional lawsuits. Federal judge dismisses reservist’s suit questioning Obama’s presidency, July 16, 2009, Georgia Ledger-Enquirer, Cook was accompanied by his attorney, Orly Taitz, who has challenged the legitimacy of Obama’s presidency in other courts. Two similar suits have previously been thrown out of federal court. 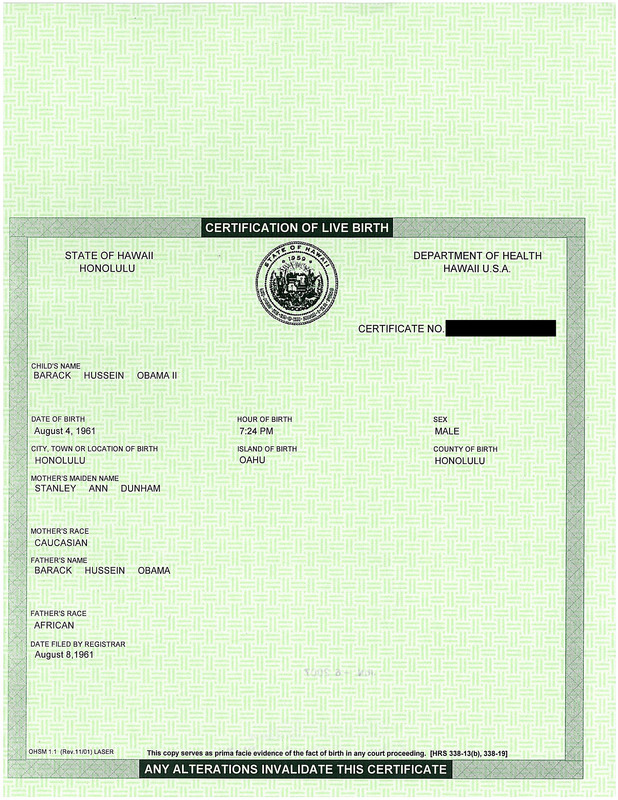 Birther Movement Dogs Republicans, July 17, 2009, Washington Independent, The urban legend has become too pervasive for Republicans to avoid. In February…. Obama Birth Issue is Nutty, July 22, 2009,CNN, The nut jobs that continue to promote this story are wacky, right-wing radio and TV talk shows hosts and no-credibility bloggers. They have latched onto this story like bloodsucking leeches, and actually want us to believe this story has legs. Lou Dobbs and the canard over President Obama’s birth, July 22, 2009, LA Times, The subject fits neatly with Dobbs’ nativist, immigrant obsession. The Born Identity: The Daily Show, July 22, 2009, Comedy Central, It’s on the Internet? Then it must be credible. McCain Campaign Investigated, Dismissed Obama Citizenship Rumors, July 24, 2009, Washington Independent. A survey of the lawsuits filed against Obama reveals a reliance on widely debunked rumors, bogus stories sourced back to web sites, affidavits from “experts” who refuse to provide credentials or even their real names, and frequent and blatant misunderstandings of basic constitutional law. CNN chief addresses Obama birth controversy; July 25, 2009,the LA Times.. Reporting from New York — CNN/U.S. 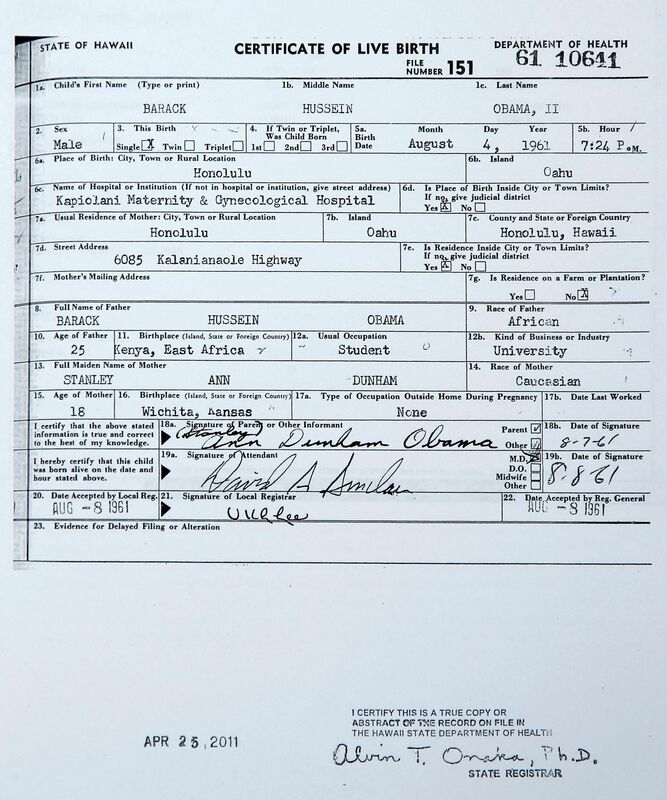 President Jon Klein told staffers of “Lou Dobbs Tonight” on Thursday that the controversy regarding the legitimacy of President Obama’s birth certificate — a topic Dobbs has avidly pursued on the air — is a “dead” story. The Birthers in Congress, July 27, 2009.Salon.com, Salon has here in its (virtual) hand a list of 17 names of members of Congress who have either expressed support for, or refused to oppose, the idea that America has a foreign president problem. 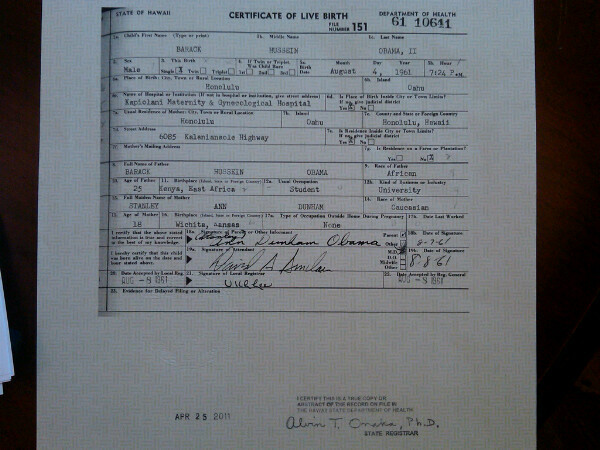 Obama Hawaii born, insist Isle officials, July 27, 2009. 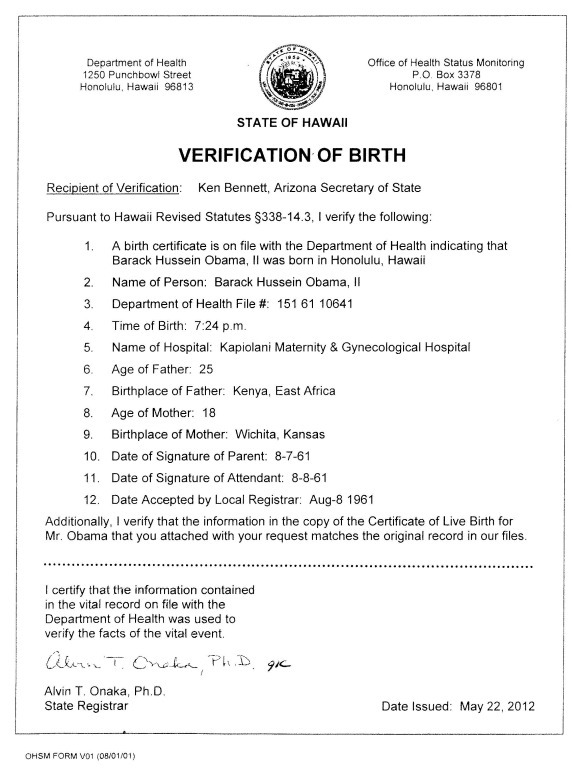 Honolulu Advertiser, I, Dr. Chiyome Fukino, director of the Hawai’i State Department of Health, have seen the original vital records maintained on file by the Hawai’i State Department of Health verifying Barrack Hussein Obama was born in Hawai’i and is a natural-born American citizen. Born in the U. S. A., July 28, 2009.The National Review, Much foolishness has become attached to the question of President Obama’s place of birth, and a few misguided souls among the Right have indulged it….But there is no such evidence, because this theory is based on unreality, as two minutes’ examining the claims of its proponents reveals. O RLY?, July 29, 2009, Fact Check.org. Colbert: So there’s absolutely nothing he can do to satisfy you? Taitz: Unless he can bring his father out of the grave and make him a citizen post-mortem. Obama birthers (editorial cartoon), July 29, 2009.Tulsa World, BLAM! It’s Certifiable, July 30, 2009, Wall Street Journal. The release of the obsolete birth certificate would not ‘resolve the issue’ to those for whom it is not already resolved. They claim without basis that today’s birth certificate is a fake; there is nothing to stop them from claiming without basis that yesterday’s is as well. Obama Conspiracy Theories, July 30, 2009, Kentucky Post. Although they’ve distanced themselves from the loonier charges, Republicans have long tried to sell the public on the idea that there’s a “secret” Barack Obama whose darker instincts endanger the country. Birthers, the Few, the Proud, Riling Capitol Hill, July 30, 2009, The Washington Post. The so-called birther bill, born out of an unfounded theory that Barack Obama is not a U.S. citizen, now has 11 House co-sponsors. Not quite a baker’s dozen, but enough to serve up a fresh batch of ridicule for the Republican Party. CNN’s Dobbs Revives Obama Birth Place Debate (Audio), July 31, 2009,National Public Radio. CNN is positioning itself as the cable news channel that sticks to the facts –” distinguishing itself from rivals MSNBC on the left and Fox News on the right. But CNN’s Lou Dobbs has thrown his channel on the defensive by focusing on repeated unfounded claims that President Obama wasn’t born in the United States.